It might not be as well-known as Ubirr or Nourlangie Rock in Kakadu, but Gabarnmung, located on the lands of the Jawoyn Aboriginal people in south-west Arnhem Land, is remarkable in its own right. 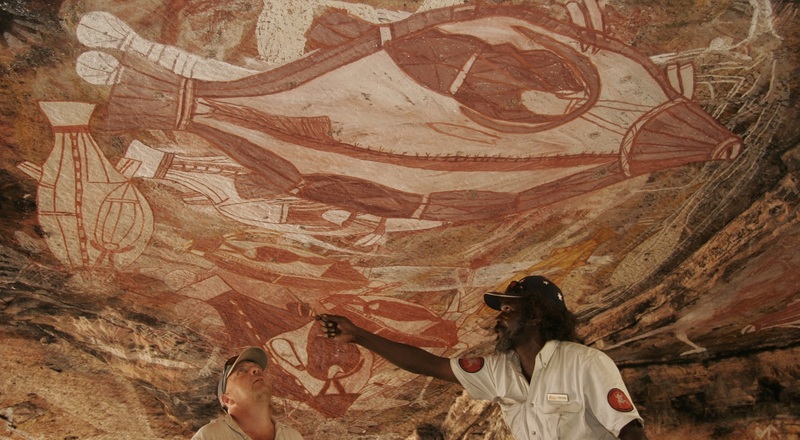 Thought to be home to the world’s oldest art, Gabarnmung is so remote that it is accessible only by helicopter and so sacred that it is currently closed to people not of the Jawoyn tribe by decree of the traditional owners. Here are five mind-boggling facts that you probably didn’t know about Gabarnmurg. Gabarnmung remained the secret of the Jawoyn people until 2006, when Ray Whear and pilot Chris Morgan spotted the site during a helicopter survey of the area. It was in 2010 that the first archaeological excavation of Gabarnmurg took place, and the site’s wonders were slowly revealed to the world. The floor area of Gabarnmung measures 19m x 19m, and the ceiling ranges in height from 1.75m to 2.45m high, making this a strikingly spacious natural rock art gallery. What makes the structure of Gabarnmung truly remarkable are the 36 pillars that have been carved from sandstone to form the supports for this ancient cave’s roof, making the massive stone slab appear to float away from the cliff it has been carved from. Because the ceiling of Gabarnmung is quite literally covered in paintings, it is revered as one of the world’s most culturally and archaeologically significant rock art sites – but it’s also one of the most ancient. Carbon dating research carried out by the University of Waikato has dated the paintings as being 28,000 years old. Vivid hues of red, white, black and orange are used to make paintings of spiritual beings, while animals are depicted in the traditional Jawoyn x-ray painting style, where the organs and bone structures of native animals can be seen. An axe head found at Gabarnmurg gave away some of the Jawoyn people’s ancient secrets when discovered by archaeologists carrying out the excavations, who dated it as being 35,000 years old. Evidence found in the cave suggests that it has been used and occupied by humans for as long as 45,000 years, which positions Gabarnmurg as one of the earliest human occupation sites. Today, the entrance to Gabarnmung sits 400 metres above sea level, but ripples ingrained in the sandstone ceiling of the site indicate that the cave was once under water. This is thought to be due to the rapid rise in sea levels brought about at the end of the last ice age. Back in 2006 Venture North was lucky enough to be granted permission to visit Gabarnmung with a local Jawoyn guide but today the site isn’t open to the public. We do hope one day we'll again visit but for now we'll continue to take guests to a myriad of other world class rock art sites throughout Arnhem Land. There is so much to learn about the traditions and culture of Aboriginal people here in the Northern Territory and we love to share it with you. All our rock art tours in Arnhem Land are lead by local Indigenous guides so you get the most authentic experience possible. 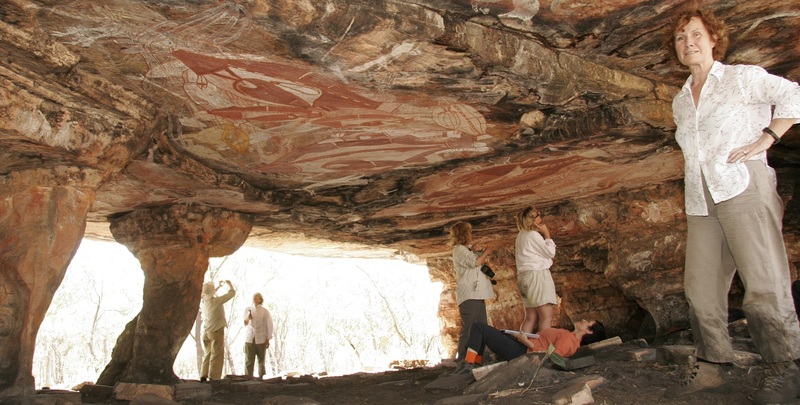 For more information about our rock art tours in Arnhem Land please email Venture North here.